My previous post about Ettercap gets a lot of hits, so I thought I should post a deeper look at some of the features with examples of usage. Before continuing, I'll point out a couple other good resources since some of my work is just building on that of others. Irongeek has a couple good pages dealing with Ettercap. There is plenty more information there if you search his site, plus a number of other sites and forums where you can find information. I decided to show a couple examples, then relate them to NSM and ways to detect ARP poisoning. I happen to be using FreeBSD as the attacking system in this case, and a Windows 7 system as the targeted system. For my experiment, I'll use the following image. Here is the filter I used to replace the page title and body with my own title and body. It includes segments from Irongeek's filter, so I'll include the GPL notice. This filter is designed to replace the "title" tag with a new title plus a body that links to the image. Then at the end of the filter, I attempt to replace the original page's title closing tag with a space since I already closed the tag, and then replace the original page's body tag with a space to eliminate the body of the page. I believe you could also use a pcre_regex command in the filter to more thoroughly remove the existing page body after inserting the image or other content of your choosing. See the etterfilter manual page for more. The "-T" option is to use the text interface rather than the GUI or ncurses. The "-M" executes a man-in-the-middle with the arguments for ARP poisoning that includes the gateway, which is the first IP address in this case. The second IP address is a Windows system. 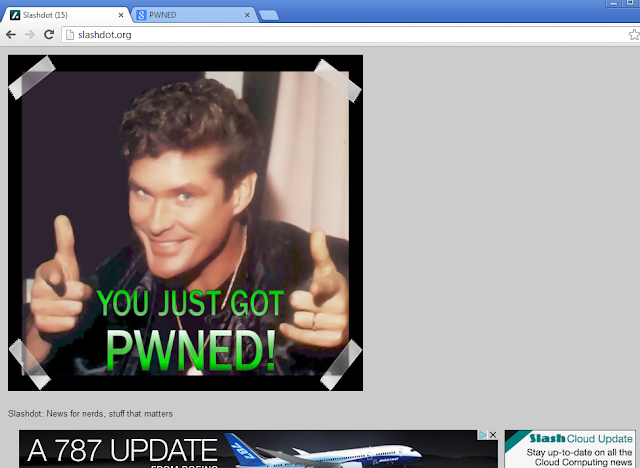 Here are some examples of the results if trying to surf using Chrome on the targeted Windows 7 system. HTML title tag. The body is also not replaced, just pushed down the page. Here is what Google looks like. Finally, here is my blog. Success once again. Both the page title and body are replaced. Another way to show how easy it is to redirect traffic to an unexpected site is with ettercap's DNS spoofing plugin. First, I edit /usr/local/share/ettercap/etter.dns and add the following lines. Then I run ettercap with the plugin enabled. This 20 second video shows what happens when I then try to go to Google or Facebook from the targeted system. 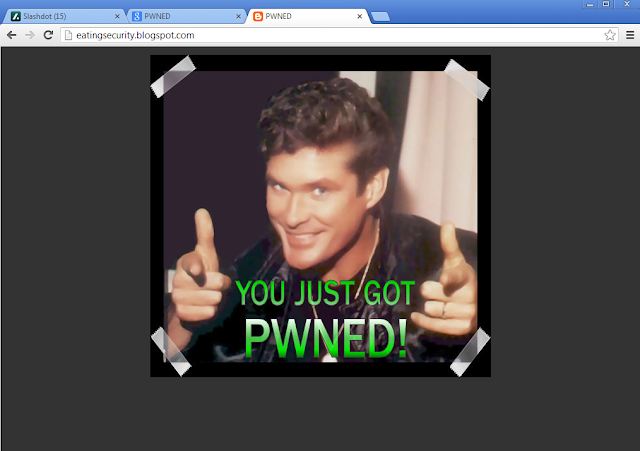 As I mentioned in a previous post about ettercap, the Metasploit site was briefly owned through ARP poisoning in 2008. It is an old-school attack that can still be quite effective if you have access to a system on the same network segment as another system you want to attack. Defenses against ARP poisoning are fairly simple to describe but not necessarily practical or easy to implement. The first, mentioned in the Metasploit article, is using static ARP tables so ARP requests over the network are no longer necessary. 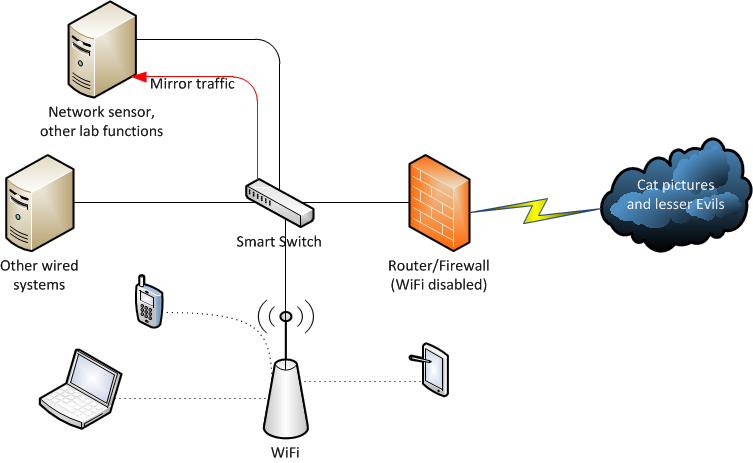 This may be simple in the case of a single gateway entry, but the larger the network the more administrative overhead to use static ARP entries. You can also use software to detect ARP poisoning, for example LBNL's arpwatch. Any software that can show you MAC addresses along with IP addresses can potentially be used to detect poisoning since you would see the same IP address in use by multiple MAC addresses. For example, here is what my ARP poisoning with ettercap looks like in Wireshark. You can see that the poisoner, 00:0c:29:6d:92:78, is associated with both IP addresses. So, it is easy to see in the traffic but that doesn't mean it is necessarily easy to detect without some analyst intervention. Snort has an ARP spoofing preprocessor, but it seems likely that an IDS will often be in the wrong position on a network to see ARP traffic. In fact, most networks are probably not instrumented in such a way that you can see ARP traffic on a NSM sensor. It is not actually difficult in a technical sense, but it does require resources to have internal network sensors and make sure the network is architected properly for the sensors to have visibility. There are probably more efficient ways to allocate resources for detection in this case. There are still other methods to help detect and prevent ARP spoofing, particularly with network equipment like managed switches. Jeremy Stretch has a good write-up on DHCP Snooping and Dynamic Arp Inspection over at his PacketLife blog showing exactly how DAI can be used to prevent and detect ARP poisoning. You can also read about DHCP Snooping and DAI on Cisco's site. This seems like it may be an easier method than IDS deployments since networking equipment is already positioned to see ARP traffic, but it does require equipment that supports ARP inspection. I had originally thought of also showing how you could combine Ettercap with Metasploit to inject malicious traffic and more in the above examples, but I decided that would overly complicate this post. It is probably better reserved for a future post. With the recent news about the latest Apache backdoor on systems using cPanel, I thought it would be pertinent to show the process of adding an OSSEC agent that connects to a Security Onion server. Why is this relevant? 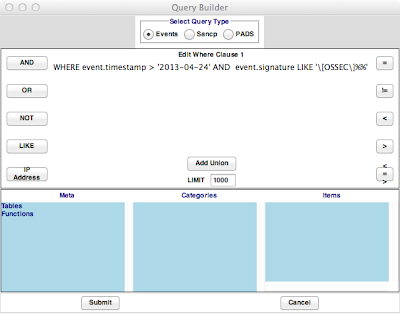 Because OSSEC and other file integrity checkers can detect changes to binaries like Apache's httpd. "OSSEC is an Open Source Host-based Intrusion Detection System that performs log analysis, file integrity checking, policy monitoring, rootkit detection, real-time alerting and active response." Many systems include integrity checking programs in their default installs these days, for instance Red Hat with AIDE. AIDE is also available in repositories for a number of other Linux distributions plus FreeBSD. This case in particular would require using something other than the default options for integrity checking because cPanel installs Apache httpd in /usr/local/apache/bin, a non-standard directory that may not be automatically included when computing file hashes and doing subsequent integrity checks. The reason I'm demonstrating OSSEC here is that it easily integrates with the Sguil console, and in Security Onion the sensors and server already have OSSEC configured to send alerts to Sguild. OSSEC also has additional functionality compared to AIDE. In this case, I'm installing the agent on a Slackware server. authentication key from the server. Next, I add the agent to my Security Onion server. Now copy the key, go back to the web server, paste and import the key. So by default OSSEC would apparently not be checking the integrity of cPanel's Apache installation and I would need to add /usr/local/apache to the directory checks. 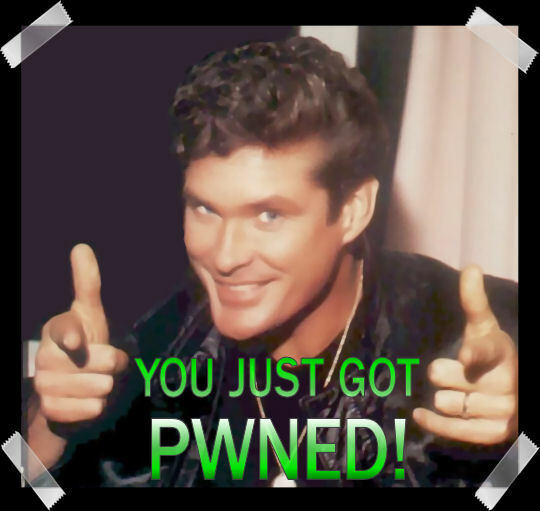 After making any changes for my particular system, I check the status of OSSEC and it is not yet running. Note after adding the OSSEC agent on the remote system then adding it on the OSSEC server, you must restart ossec-hids-server in order for the ossec-remoted process to start listening on 1514/udp for remote agents. OSSEC analysisd: Testing rules failed. Configuration error. Exiting. 2013/04/30 23:13:59 ossec-maild: INFO: E-Mail notification disabled. Clean Exit. Note the error corresponding to the FAQ entry about getting an error when starting OSSEC. 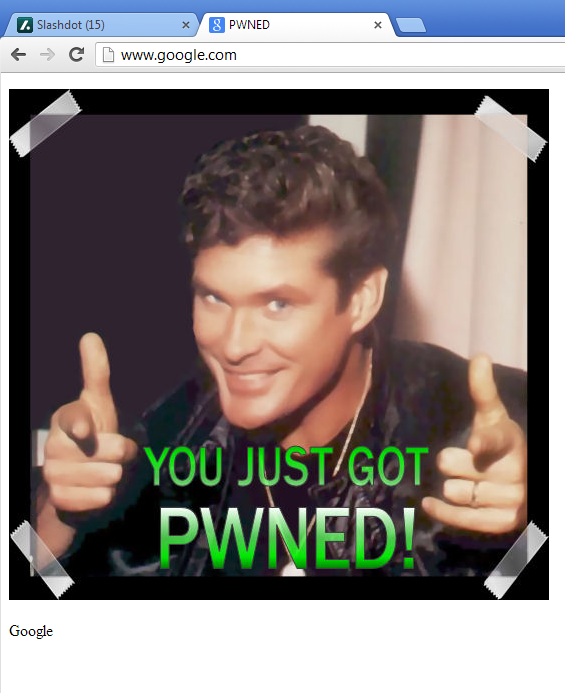 However, since I'm running OSSEC 2.7 this did not seem to apply. Poking around, I realized the ossec-logtest executable had not been copied to /var/ossec/bin when I ran the install script. After I manually copied it to the directory, restarting OSSEC no longer caused the "Testing rules failed" error. 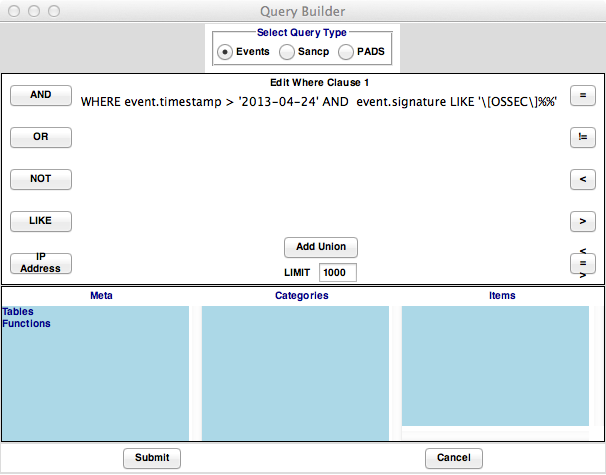 In the Sguil console, if I wanted to view all the recent OSSEC alerts I could perform a query as pictured below. Note you need to escape the brackets or remove them in favor of the MySQL wildcards '%%'. Finally, to show an example of the various types of alerting that OSSEC can do in addition to checksum changes, here is a query and output directly from the MySQL console. The highest count alert, plus the alerts indicating "2nd time" and "3rd time", are the basic functionality needed to detect changes to a file, my original use case. The "rootcheck" is alerting on files owned by root but writable by everyone. The balance of the alerts are from reading the system logs and detecting the system rejecting emails (anti-spam, 504) or web server error codes. Back to the original problem of Cdorked.A, the blog posts on the subject also indicate that NSM could detect unusually long HTTP sessions, and there are no doubt other network behaviors that could be used to create signatures or network analytics resulting in detection. File integrity checks are just one possible way to detect a compromised server. Remember you need to have known good checksums for this to work! You ideally install something like OSSEC prior to the system being live on the network or at the least prior to it running any listening services that could be compromised before computing the checksums. As I stated in my previous post about a new home lab configuration, I decided to try VMware ESXi 5.1 on my new Shuttle SH67H. ESXi is free for uses like this, presumably because it clearly benefits VMware if professionals can use it in a lab setting and that encourages use of their paid products in production. I have seen some conflicting accounts, but it appears that the main limit on the free version of ESXi 5.1 is 32GB of RAM. I won't go into too much detail about the installation since it is adequately covered by a couple of other posts I found prior to purchasing my system. I will mainly cover details that stood out and things I discovered as someone new to ESXi. I had already planned to get a Shuttle for the small form factor, low noise, and low power usage. Finding out that the SH67H could be used as a white box for ESXi made it easy to pick an initial project once I built the system. (Okay, we could quibble over whether a Shuttle counts as a white box). Additionally, since my previous home network sensor running Sguil had died, I figured that the first VM to build would be Security Onion but that I'd still be able to run multiple other VMs without impacting my home lab NSM. Getting ESXi installed on the Shuttle was pretty simple. After booting to CD, I just followed the prompts and made sane choices. The one thing to note is that I installed ESXi to an external USB flash drive. Since the OS is so small, it gets loaded primarily to RAM at boot anyway. Using a flash drive has some advantages and some disadvantages, as shown in many discussions on the VMware and other discussion boards. For my home lab I decided to install to the flash drive, but chances are that it will actually make no difference to me. Some ESXi servers have no local storage, so I imagine it is particularly common for those systems to use a USB flash drive. 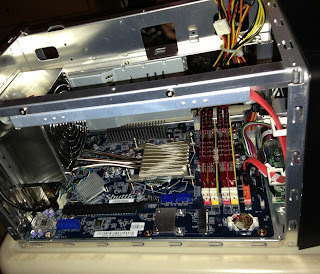 After using directly connected keyboard and monitor, I moved the system into my home "server closet" and booted it headless. I installed the vSphere Client on my local Windows VM since I don't have a non-VM Windows installation. The vSphere Client was surprisingly easy and I might even go as far as user-friendly. You can see in the screenshot below that it is relatively straightforward. The error states "System logs on host vmshuttle are stored on non-persistent storage." The first thing I noticed was, because of installing ESXi to the flash drive, I got the error shown in my screenshot. This error was only temporary. I am not sure when it was resolved, most likely after a reboot or I created the initial guest VM, but the system created a ".locker" directory in which I can clearly see all the logs. I am assuming they are persistent since vmstore0 is the internal 1TB hard drive, not the USB flash drive. I believe another option for fixing the error would be to manually set the scratch partition as detailed in VMware's Knowledge Base. Note that I haven't actually tried that to date. Before being able to SSH into the ESXi host and look at the above directories and files, I had to enable SSH. The configuration for SSH and a number of other security-related services is available in vSphere by highlighting the host (since in the workplace you may use vSphere to manage multiple ESXi systems), then going to the Configuration tab, Security Profile, and finally SSH Properties. If you haven't noticed already, ESXi defaults to using root for everything. I haven't yet investigated the feasibility of locking down the ESXi host, but I think it's safe to say most people will rely on keeping the host as isolated as possible since the host OS is not particularly flexible or configurable outside options VMware provides. I decided the best way to use vSphere would be to copy my Windows 7 VM from my laptop to the ESXi host. Trying to scp the VM then adding it to the inventory never worked properly. I had similar problems when trying to scp a CentOS VM from my laptop. When I tried browsing the datastore in vSphere and adding a local machine to the remote inventory, it would get partway through and then fail with an I/O error. I believe this was all actually a case of a flaky wireless access point, but even in cases where I successfully copied the CentOS VM I got errors when trying to add it to the inventory. I eventually got it to work by converting the VM locally using ovftool then deploying it to ESXi. OVF is the Open Virtualization Format, an open standard for packaging virtual machines. The syntax to convert an existing VM is simple. First, make sure the VM is powered down rather than just paused. On OSX running VMware Fusion, you can export a VM easily. After the conversion, the VM still needed to be exported to the ESXi host. I plugged my laptop into a wired connection to speed the process and eliminate any issues I was having over wireless, then sent the VM to ESXi. The options I used are to set the datastore, disk mode, and network. Once the VM is copied to the host, you will need to browse the datastore and add the VM to the ESXi inventory. 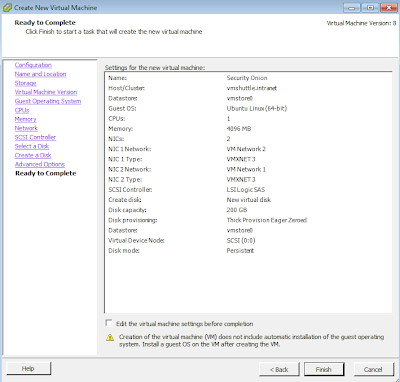 Other ways to move a VM to ESXi are not endorsed by VMware. They officially recommend using OVF to import VMs. All things considered, getting ESXi installed and configured was relatively easy. There are certainly drawbacks to using unsupported hardware. For example, vSphere does not display CPU temperature and other health or status information. I believe ESXi expects to use IPMI for hardware status like voltages, temperatures, and more. 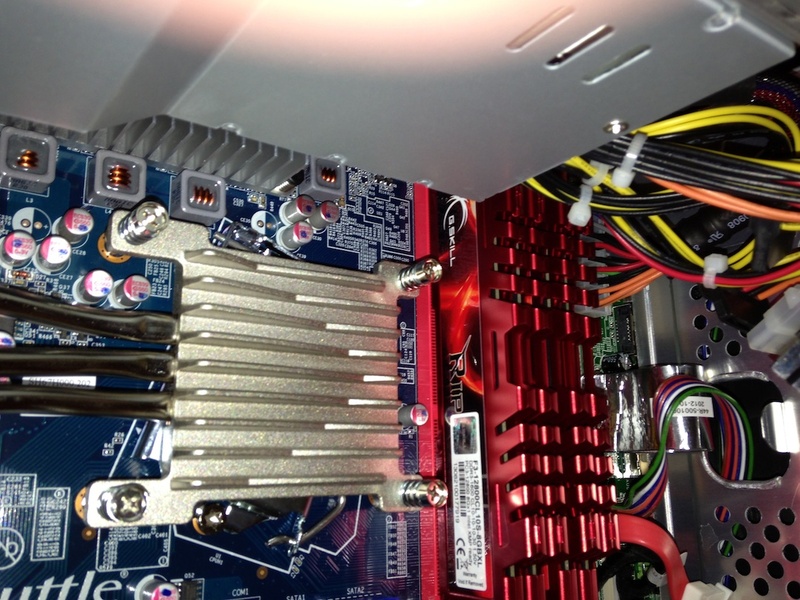 There are options to consider for anyone wanting a home lab using supported hardware. VMware maintains a lengthy HCL and I presume systems on their list support all the health status information in vSphere. 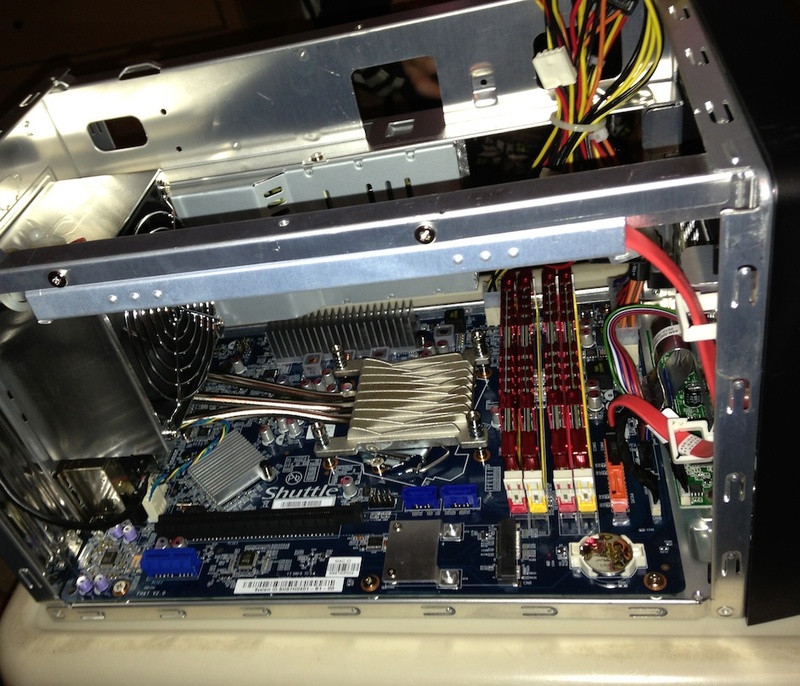 I did find several possibilities to buy used servers like a Dell PowerEdge 2950 at reputable sites for about $650. Since I didn't want the noise, don't have a rack, and may not keep the system as a dedicated ESXi host, I did not go that route for a lab system. As stated, the first VM I built was Security Onion. 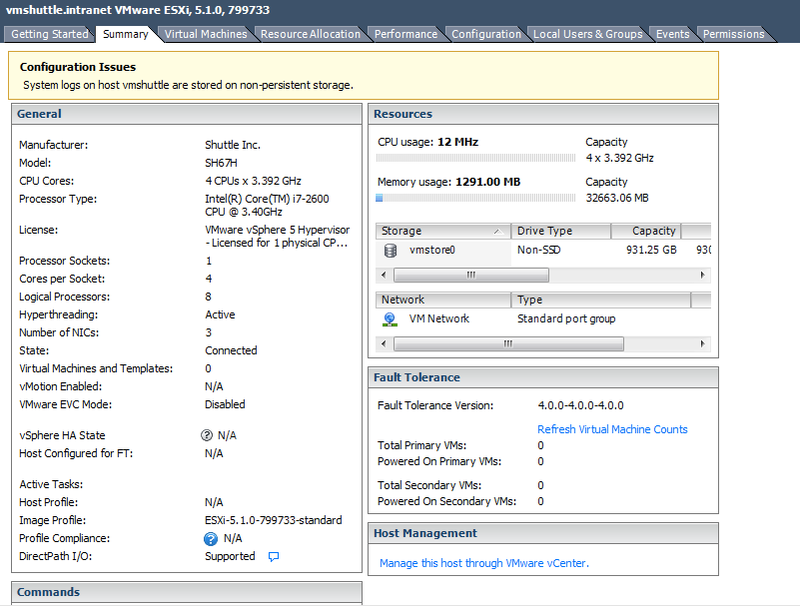 I did this through the vSphere client and include some screenshots here. Most of this applies to building any VM using vSphere. 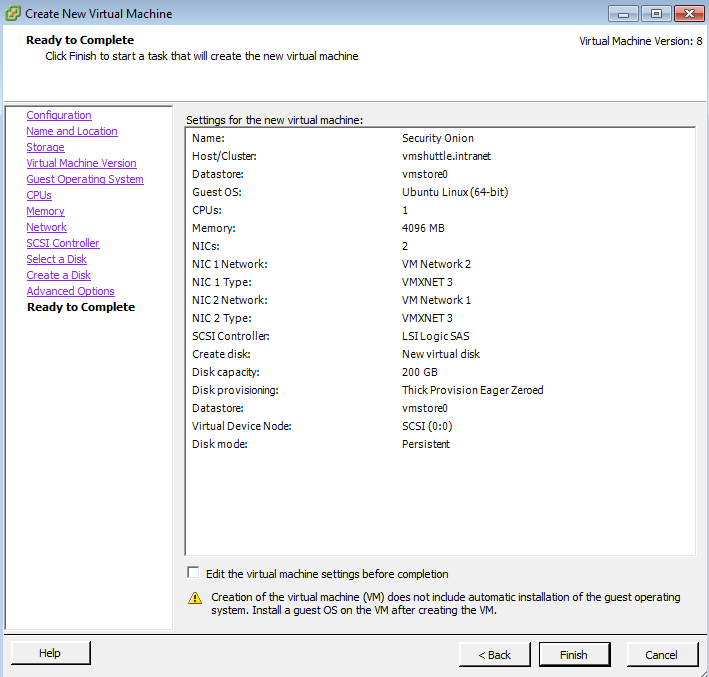 After choosing the option to create a new VM, I selected a custom configuration. I named the VM simply "Security Onion" and chose my only datastore, vmstore0, as the storage location. I am not concerned with backwards compatibility, so chose "Virtual Machine Version 8." I chose only one core and one socket for the CPU, but allocated 4GB of RAM since I knew the combination of Suricata, Bro, and other monitoring processes would eat a lot of RAM. I was installing 64-bit, so I chose 64-bit Ubuntu as the Linux version. 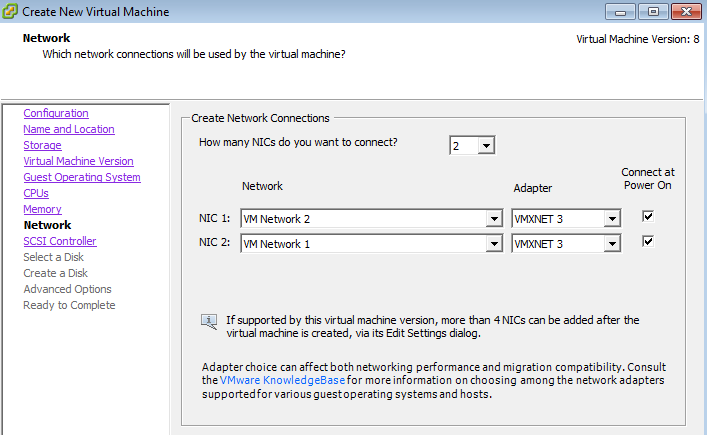 I selected two NICs both using VMXNET 3, which was probably the first non-standard selection in my custom configuration. I wanted to make sure I had separate management and promiscuous mode NICs since this will be a sensor. 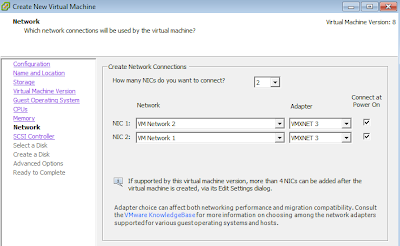 The option for VMXNET 3 should not be available as a choice if you previously selected an OS that doesn't support it when you created the VM. I next chose the LSI Logic SAS for the SCSI Controller. Although I think it won't matter for Ubuntu, note the following from VMware's local help files. "The LSI Logic Parallel adapter and the LSI Logic SAS adapter offer equivalent performance. Some guest operating system vendors are phasing our support for parallel SCSI in favor of SAS, so if your virtual machine and guest operating system support SAS, choose LSI SAS to maintain future compatibility." This is a good time to point out that hitting the "Help" button in vSphere will open the local help files in your browser, and they contain actual useful information about the differences in choices when configuring the VM. In the case of the help button during the process of creating a new VM, it will actually open the specific page that is contextually useful for the options on the current step of the process. In general, both their help files and the Knowledge Base seem quite useful. Finally, I created the virtual disk. This includes deciding whether to thin provision, thick provision lazy zeroed, or thick provision eager zeroed, meaning prepare the disk ahead of time. The documentation states that eager zeroed supports clustering for fault tolerance. I chose thick provisioned for my Security Onion since I knew with certainty that the virtual disk would get filled with NSM data like packet captures and logs. There are a number of KB and blog posts on the VMware site that detail advantages and disadvantages of the different provisioning methods. Once the VM was configured on ESXi, I still needed to actually install Security Onion. You can do it the old-fashioned way by burning a disc and using the CD/DVD drive, but I used mounted the ISO. To do this, you just need to start the VM, which doesn't yet have an OS, then open a console in vSphere and click the button to mount the ISO in the virtual CD drive so it will boot to the disc image and start the installation process. The vSphere console is a similar view and interface to Fusion or Workstation and mounting the ISO works essentially the same way. The time it took from hitting the button to create a VM to the time I had a running Security Onion sensor was quite short. I had a couple small problems after the initial installation. First, in ESXi you have to manually go to the NIC settings and check a box that allows it to sniff all the traffic. My sniffing interface was initially not seeing the traffic when I checked with tcpdump, which made me realize it was probably not yet in promiscuous mode. Second, the 4GB RAM and one CPU I had initially allocated was insufficient. When the sensor was running and I tried to update Ubuntu, the system became very unresponsive. I eventually doubled the RAM to 8GB and the number of cores to two, which resolved the issue. I think at this point that I could probably actually drop back down to 4GB of RAM, but since the system has 32GB I don't need to worry about it yet. I can get smartd information from my hard drive if needed. There is a lot more you can do from the ESXi command line interface, but I should emphasize again that it is stripped fairly bare and does not have a lot of commands you expect if you come from a Linux or Unix background. Even some of the utilities that are available do not have some of the options or functionality you would expect. The CLI commands will generally list options or help when run without arguments. You can also get plenty of CLI documentation from VMware. I now have a number of VMs installed, including a CentOS snapshot, FreeBSD, and my Windows 7 VM. My next steps will include setting up some VLANs to have some fun with a vulnerable network and an attacker network that will include KaliLinux. I am intimately familiar with Sguil and some of the other tools in Security Onion, but also hope to dig into Suricata and Bro more than I have in the past. I also hope that my lab will provide some interesting material for future blog posts. The company I work for is hiring. For those that don't know, CERT is part of the Software Engineering Institute at Carnegie Mellon University. CERT was created in 1988 as part of the response to the Morris worm. You can find out more on CERT's "About Us" page. If you are interested, please read more about our hiring process and browse some of the available positions. The positions are primarily in Pittsburgh with a few openings in Arlington, VA. The open positions cover network security analysis, security architecture, malware analysis, software development, vulnerability analysis, and more. I consider our hiring process fairly grueling but also stimulating. It gives the prospective employee and prospective coworkers a good chance to really learn if the relationship will work. It is an opportunity not just for the candidate to get interviewed, but also for the candidate to interview those that already work at CERT. One of the reasons we have so many vacant positions is because we try to maintain high standards when considering candidates. Most of our positions require a fair amount of experience and expertise. My colleagues are smart, diligent, and largely enthusiastic about their chosen professions. Don't get me wrong -- we still have bad days when we are less enthusiastic or unhappy about the state of information security, but this is a pretty cool place to work. We do a wide variety of both research and more operationally focused work, tackling a lot of big problems. We also get a fair amount of freedom to find interesting and challenging areas of work. If I know you or know of your work, please contact me about using my name as a referral. A referral from a current CERT employee can be helpful when applying. The best way to contact me regarding a referral or to ask other questions is via email or LinkedIn. You can also post questions more publicly here on my blog if it seems appropriate. In the interest of disclosure, I have an interest in recruiting people that I will want to work with but also could potentially get a referral bonus if you list me when you apply.